The breakthrough came on a Saturday. I was participating in the Ask Andrea Hip Home Improvement radio show, a program focused especially on energy efficiency and green building. I was there to add the preservation perspective. One of the guests was a contractor known for his experience with green building and during the course of his time he was asked about energy efficiency improvements to old wood windows. In a market flooded by the conviction that existing old windows should be replaced by new windows that use double glazing (insulating glass units), I was shocked by what he said; " Well, of course, the primary problem with old windows in this part of the Country is air infiltration..." Precisely the message that I and others experienced in preservation had been preaching for some years. This marked the first time that I heard such a proclamation from someone outside of the preservation field. Historic wooden windows, especially double hung, do a pretty good job and don't perform that much differently than their modern counterparts except in one area, air infiltration or air leakage. You have likely felt distinct drafts while next to these windows and have seen strong winds cause blinds and drapes to move inside the building. During the restoration of the Erath County Courthouse (Stephenville) all windows had been replaced (twice) under previous renovation efforts. Our proposal to install new windows that replicated the original historic windows was met with skepticism by the County Judge, who made it especially clear that he did not want cold drafts coming in through the new windows. The good news is that air infiltration is one of the easiest and cheapest problems to fix and certainly doesn't require window replacement. My last post on this subject revealed that the use of insulated glass in windows was primarily designed to keep heat in the building and, as such, was of questionable use in warmer southern climates, especially when considered against the likely cost and effort required. Most would probably agree that keeping heat out of a building to be more important in Texas, especially the heat conveyed by the entrance of sunlight. The transfer of heat as solar heat gain is known as emissivity and the resistance to solar heat gains is expressed as the Solar Heat Gain Coefficient (SHGC). It is also considered within energy code calculations and noted in the published performance of new windows. A window is just a hole in the wall, but that's ok.
At least in nice, warm Texas. One of the most common and often contentious issues we face in doing historic preservation is the Owner's desire to upgrade the energy efficiency of historic windows, especially wood double hung windows. The quick answer is to just replace the old with new, but I have written before that much of the momentum behind this approach seems to come from the folks who sell new replacement windows. I wanted to research this issue a little more deeply and started with non-preservation sources who's focus is on energy conservation. What I have found is pretty interesting, especially since it seems to support the things we've said all along. First we need to look at how the energy performance of windows is measured. This is called U-Factor. You may be more familiar with R-Value because that is what is used in insulation; R-11, R-19, R-30, etc. For reasons I won't go into here but that you can read for yourself at the National Fenestration Rating Council website, U-factor is just the inverse of R-value, or 1/R-value. So the U-factor of that R-11 insulation is 1/11 or U-.09. In an article on windows and doors in the September/October issue of Architectural West magazine, it notes that a recent market study by the Freedonia Group suggests strong growth in the new window and door market. Most of this growth is projected in developing countries. What caught my attention, however, is the note that "improvement-related" window sales will outstrip new sales in the developed countries, including the US. Good news for them, perhaps, but a potential problem for preservationists. I was recently reminded of the on-going battle to preserve historic wood windows. A parent at a local school (a very impressive 1929 building) approached me and asked what it would take to get all of the existing historic windows replaced. I noted that, in addition to being contrary to the preservation of the school, it was a designated local landmark and that the windows were protected. It was not the answer she was looking for, apparently. The windows are in some trouble, to be sure. Although neglected for decades, there was so little money allocated for the windows under the current bond program work that they opted to simply do nothing and use the funds elsewhere. The likely best case scenario now is 2 years and another bond program before anything substantial can be done. I hope they can make it. 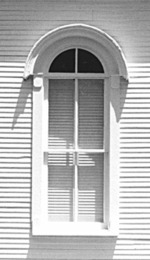 This points out what I perceive as the two common problems that historic wooden windows face in the modern world: decreasing resolve to maintain them, stemming in part from fewer craftspeople with the proper skills to maintain them properly, and ever-increasing pressure from well-funded corporations who offer modern replacement products. It's a fairly complex subject and I will begin a series of postings that break down these conflicts and provide guidance to readers facing them.